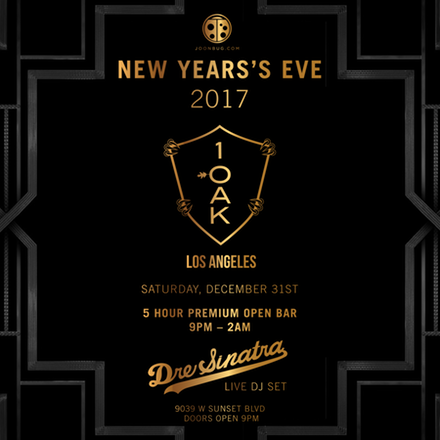 Celebrate this New Year’s Eve like nightlife royalty at 1 Oak nightclub. With a 5 hour premium open bar setting the deluxe mood complimented by NYE party favors adorning the fashionable crowd like ironically chic statement accessories. This late-night phenomenon’s trademark atmosphere is as dynamic as ever this NYE, with a live DJ will spinning super-hot beats of Top 40, Hip Hop, House and Mash Ups, enticing 1 OAK’s gorgeous crowd to the sizzling dancefloor. As festivities reach its peak at midnight, the DJ will lead trendy party-rockers in an exhilarating live countdown, complete with a complimentary champagne toast and a thrilling energy, kicking off the New Year with a bang. For partiers of the most opulent persuasion, 1 OAK – Los Angeles’s authority of the velvet-rope nightlife – offers a host of VIP packages that offer exclusive access to a mezzanine section and reserved VIP seating in addition to luxurious table and bottle service.